Ari is involved in many educational activities. He has served as a board member and president of The American Cheese Society and as a board member of the Retail Division of the National Association for the Specialty Food Trade. He is a frequent guest speaker in business classes at the University of Michigan and Eastern Michigan University, as well as at various food and business conferences. Kyle Davis: With us today, we have Ari Weinzweig. He is, I guess, the head of Zingerman's Delicatessen. He's an author and so much more, as people know. I don't like doing the long intros. On the phone today, we have Gail Davis joining [00:01:00] us, as well as Ari. With that being said, Ari, for people who don't know who you are or your background, go ahead and introduce yourself and tell us a little bit about yourself. Ari Weinzweig: Absolutely. I am, I guess you could say, the co-founding partner of Zingerman's community of businesses in Ann Arbor, Michigan. Paul Saginaw and I, my partner, started the deli in 1982. We're going to have our 36th anniversary in March, which is sort of hard to believe. [00:01:30] Today, the organization includes, I think we're at ten different businesses, all located here in the Ann Arbor area. Our vision is that we only do each business once. We like to keep creating unique things. We can talk more about that, if you want, later. They're all here in town, so I like to be close to the businesses and be able to be in them. I'm standing in ZingTrain right now, which is our training business, but I started the morning at our coffee company and I was over at Zingerman's Roadhouse, which is a sit- [00:02:00] down restaurant where we do all regional American food. We also have a mail-order business, a coffee roasting I mentioned, a candy business where we make handmade candy bars, a bakery. What am I forgetting? The deli is the original business, and Miss Kim is our newest business, which is a Korean restaurant. We also have an event space at a farm about 15 minutes from here, just on the edge of town, that does corporate events and everything. We renovated an 1834 [00:02:30] farmhouse and an 1837 barn. That's what we do. Today, we have about 700 employees, plus we hire about 300 more for all those gifts that get sent out from our mail-order at the holidays. We'll do about $65 million in sales this year. Ari Weinzweig: There's lots more to tell you, but that's a thumbnail sketch. Kyle Davis: I think that's a good place for us to start as a thumbnail sketch. 26 years ago, roughly, [00:03:00] you started as the deli or the delicatessen. Kyle Davis: 36. Wow. Sorry. Clearly, I was overwhelmed and I couldn't remember it, but 36 years ago, you started as the delicatessen or the deli. Now you've grown into this. One of the key things that I kind of picked up that you said is that you want to create unique things and you don't want to do it twice. Kyle Davis: Could you speak to that a little bit, and maybe how you got started as a deli and then expanded from there? Ari Weinzweig: [00:03:30] Yeah, absolutely. I grew up in Chicago, which is, for those of you listeners that are not familiar with Midwest geography, is about four hours to the west of Ann Arbor. I came up here to go to school. I studied Russian history. As you and I were talking earlier, I had a particular focus on the anarchists. We can get into anarchism later, if you want. I graduated from the University of Michigan. Of course, if there's any other history majors listening, they know what I know, too, [00:04:00] which is there's nothing you can really do with a history degree other than go back to school and get some more degrees. Ari Weinzweig: Which is what I was supposed to do. Anyway, I mostly, when I graduated, I just knew I didn't want to move back home. In order to make that financially possible, I decided I would get a job. I had driven a cab while I was in school, which was not enormously exciting. One of my roommates was waiting tables at a restaurant in downtown Ann Arbor. I thought, "I'll go in there. I'll try to get the same kind of job he's got." [00:04:30] Long story short, after applying two or three times and having them tell me they'd call me as soon as something opened and they still hadn't called me. I was totally running out of money, so I went back and offered to do anything. They offered me a dish washing job. I took it. That's how I got started. There was no lifelong fascination with food or cooking. There was no entrepreneurial drive. There was no interest in business. I just really lucked out because I stumbled into work that I really loved. I love the [00:05:00] food, and I've actually gotten to put my history degree to work because all we really do is traditional food, so a lot of my time is spent studying, writing about, teaching about where the food came from. Then also, I got lucky because I met great people. Paul Saginaw, who's been my partner in all this from the get-go was the general manager at that restaurant. Frank Carollo, who's one of the partners at our bakery, Zingerman's Bakehouse, was a line cook, and Maggie Bayless, who's the managing partner at ZingTrain, our training business, was a cocktail waitress. [00:05:30] Who knows why we were all in there together, but we're now close to 40 years of knowing each other. That's pretty good. Kyle Davis: Yeah, I would say so. Coming back to that original question, why is it that you want to create these unique businesses? I think for a lot of people and as a history major, I can pull lines from anything and make it work in my head. I could probably see where you're going with a lot of this stuff, but how does on person go from a deli to [00:06:00] a training company and everything that you've done since? Ari Weinzweig: From the get-go, I really wanted to have only one deli. My experience in the food business is, not that it's evil to open multiple units of the same thing, but the further you get from the original, to me, it's always the less interesting it gets. The energy becomes diluted. The owner's not present, and it's not a bad place, but that kind of buzz and that amazing feeling that you got [00:06:30] when you went into the original space just sort of goes away, and I hated that, so I really didn't want to be part of that kind of a context. To this day, I think if you go to Starbucks in Seattle, to the original store, it's just far more interesting than the one five blocks from wherever you are right now. I was very committed to having only one. Fast forwarding about 12 or 13 years in, Paul and and I had unwittingly or unconsciously [00:07:00] fulfilled the original vision that we'd had for our business. We'd expanded it twice. We started with 1300 square feet. We probably tripled that size. We were written up in New York Times, Gourmet, Bon Appetit, all those things that folks say you're successful. Yet we were at a point so many other people are. You've succeeded in a way, but at the same time, you're not rich. You're not retiring. You're not done. Paul, with no real warning, sat me down one summer morning in front of the deli on the bench out there, [00:07:30] and threw this question at me of, where do you want to be in ten years? The truth is, I had no clue. I wasn't satisfied. I wasn't stuck in the status quo. I was always trying to improve, but there's a big difference between trying to improve what you have and having a really clear, inspiring vision of the future to go after. That's what he was asking me about. I don't think he really had one either. He just had the sense that we needed a new one. That led to literally a year of conversation, eye-rolling, [00:08:00] cursing and long walks. Out of that came a new vision that we called Zingerman's 2009. We actually went 15 years into the future, not ten. In that vision, which was about six pages long, that was the first time that we really wrote out a vision in the way that we now teach it and I write about it and we use it so extensively in the organization. We wrote out this vision for 2009 that talked about having a community of businesses, all located here in the Ann Arbor area, like I said [00:08:30] earlier. Then, to your question, each would be unique. This was a way we could grow and provide opportunity for people by expanding the organization, but still stay true to having just this one unique Zingerman's Delicatessen that you had to come to Ann Arbor to experience. As part of that, we decided that we would have managing partner or partners in each business, because I've just always found that when there was an owner or owners on site, things got better. That's what we set up. The idea was to create [00:09:00] a synergistic organization where each piece was contributing positively back to the others and where we could provide a lot of opportunity for people in the organization to grow because they could become partners in their own Zingerman's business. Kyle Davis: Mm-hmm (affirmative). One of the kind of interesting things, and you've hinted at it a few times. You studied anarchism and anarchy and all that fun stuff. 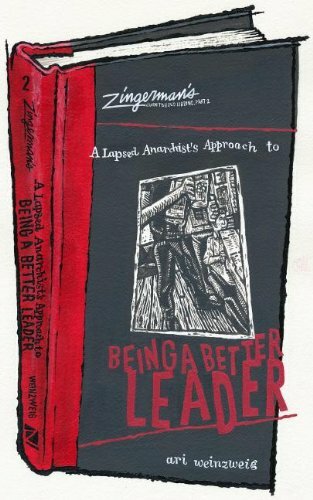 All the subtitles of your books is A Lapsed Anarchist's Approach to, and then it's Building a Great Business or [00:09:30] Being a Better Leader, which is kind of totally antithetical to a lot of anarchist's views on how to operate, I guess you could say. How did you go into the anarchism, and then how did you come out to say, "I want to run more of a traditional business," but with your own bent? Ari Weinzweig: It's an interesting story. I studied it when I was in school. We have the largest anarchist collection in the country, [00:10:00] is here at the Graduate Library at the University of Michigan. In fact, I just wrote a fund-raising letter for them the other day. I just was really drawn to it. Free thinking, encouraging people to be themselves, not getting stuck in social norms that you don't choose of your own volition, etc, etc. After I graduated and I got my dish washing job and I started to get promoted and I started to line cook. Within a year and a half or something, I was assistant manager. I [00:10:30] tried to manage people using my anarchist ideals, by leaving them alone. That didn't really work that great, so for many years, I would say I was a lapsed anarchist, because I still believed in it, but I didn't practice. I don't know, about nine years ago maybe, when I was working on part one of the leadership series, I just coincidentally, I was working on a book. Deborah Dash Moore, who is still the head of the Jewish Studies Department here asked me to speak. [00:11:00] She had heard me speak in business settings before where I referenced briefly being a lapsed anarchist, but she, of course, studied the anarchists. She's in Jewish studies, and a lot of them were Jewish. I had just written a 10,000-word essay on the history of Jewish rye bread, also, which she was very interested in, so she proposed titling the talk Rye Bread and Anarchism, which I thought sounded cute. I said, "Great, let's run with it." This was about ten months before the actual talk. 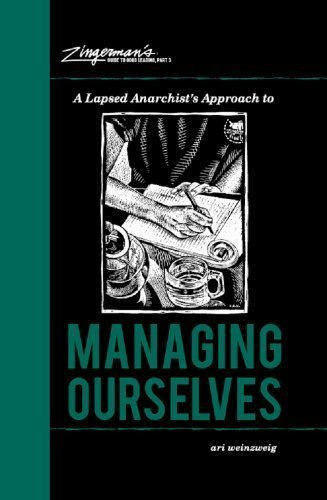 Then when I got about two months before the talk, I was like, "Man, [00:11:30] I'm going to embarrass myself really badly because I have not looked at any of these anarchist books in 20 years. I'd better get my act together and go find my books and start to re-study so I don't humiliate myself." When I started to re-read it, it kind of blew me away. It did blow me away for two reasons. One, because there was a lot of stuff in there that I hadn't really consciously realized that Paul and I had built into the way we were running the organization already, that was very aligned with [00:12:00] those beliefs. Even more importantly, because the parallels between what's now called progressive business and you and I both read a lot of books on that subject and what the anarchists were writing about 100 years ago blew my mind. Their major theme was getting rid of government. That's not my theme. I don't have strong feelings about government one way or the other, but beneath that were all these amazing subtexts about how important it is to treat every individual [00:12:30] with dignity, how everyone is a creative, intelligent human being that's capable of doing great things, about the importance of free choice, about when people design the organization of which they're a part, things go better. Today, we call that self-organizing work teams and workplace engagement and all sorts of other fancy business school buzzwords, which basically are saying the same thing. That drove me to really study and study and study, because as you know, that's all history [00:13:00] majors really know how to do. I don't know how many hundreds of books I've read in the ten years since on the subject, but it really gave me a lot of good insight into how hierarchy and hierarchical thinking are getting in the way of creating greatness in our organizations and how we're missing out on the capabilities of a lot of the great people that we hire just because they don't have that title or they're not at the top of the org chart. I think that was already aligned with how Paul and I were trying to [00:13:30] work, but it gave me a whole new set of tools to make it even more effective. Kyle Davis: What are companies missing out on if they operate under the traditional MO of a hierarchical pyramid-type structure, command control, whatever you want to use versus being one of co-determination, to use the German? Ari Weinzweig: I think that, it's my belief that everybody is capable of leading and everybody's capable of doing great things. When you have a hierarchical [00:14:00] mindset, then people are excluded from the conversation because they are a 17-year-old busboy and not a 47-year-old vice president. The problem is, the busboy knows all sorts of things that the vice president would benefit from and vice versa, too. The point is that everybody knows something that we can help the organization run better by tapping into. We do stuff like all our meetings, with very few exceptions, like if it's a private HR issue or whatever, [00:14:30] all our meetings are open. People want to come and participate. We love to have their input. We try to teach everybody how to think like a leader and think like a businessperson from the time we hire them. Even if they're coming in part-time as a dishwasher, in essence, they don't really know it, but we're teaching them how to work and operate a business. When people are learning how to lead and they're learning how to run a business, lo and behold, the quality of the decision-making they make on shift every day gets drastically better. By contrast, most employees in most [00:15:00] businesses get taught how to do their job, but they really have no clue whatsoever how the whole thing works. Consequently, the decisions they make tend to seem really stupid to the people who know what they're doing. Go ahead. Kyle Davis: I think from that, I don't know if my mom has anything to add to this or not. When you have a, I forgot, what's the micromanagement style that a lot of more [00:15:30] legacy-style companies or people who have been in business a while who haven't been really aware or opened up to these open environments, open meetings, high levels of transparency. What are they missing out on? I think to me, it's very clear. Having worked in startups and having a Notes app where every note with a meeting of three people or more was sent to everybody in the company. That transparency is key, and it allows us to kind of have ownership [00:16:00] versus being directed and not always being sure of, did we make the right decision? Always having to ask questions. Ari Weinzweig: Yep. There's a whole range of issues that come up. One is, I think the old command and control model operates, it's basically the industrial model put into practice in business. It operates under the assumption that basically front-line people don't make decisions. "We at the top" make the decisions. They just implement them. Of course, they're making [00:16:30] thousands of decisions every hour. Should they be nice to the customers? Should they be nice to their coworkers? Should they move quickly? Should they move slowly? Should they double-check the order or not? These kind of decisions are getting made all the time. If they don't have good information about the business's finances or about how to think like a leader or about our ethics and values, then the decisions that they make are likely to be really poor. Then we've all got to work five times harder to make up for those bad decisions. [00:17:00] If a front line employee who works at Zingerman's thinks that we have so much money, we don't know what to do with it, then why would they fight to get an extra sale? When they're dealing with open book and they understand how the whole thing comes together and where profit goes and how you use it to pay down debt and how you use it to fund new capital purchases and how it funds bonuses and stuff, then all of a sudden, everybody's a lot more engaged in the work. They understand, in the same way that in a football game, one play [00:17:30] can turn the entire game. It's the same in business. The next man or woman who comes into the deli, we don't know. 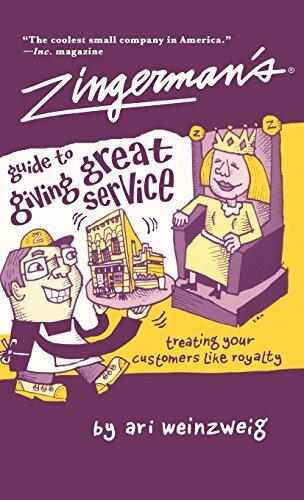 It could be the corporate gift buyer for Google, and they could have an exceptional service experience while they're on their way to their normal or previous corporate gift supplier, and they could have a bad service experience there. Just the quality of the service on the counter at the deli could turn that whole thing around. It could land us a half-million-dollar account. I think they're missing out on that. Also, there's a lot of creativity [00:18:00] and insight that people have that by definition, if you're at the top, you have a lot of [inaudible 00:18:07], but you're also missing out on what it's like to be at the bottom. Kyle Davis: I think we've hinted on this, but you have a four-part series that's the Guide to Good Leading. The first part is Building a Great Business. We've talked about, I believe the next part, which is Being a Better Leader. How important is it that people appropriately manage [00:18:30] themselves? To me, it seems like a no-brainer, but a lot of people, especially from a command control model, just push it down. They don't really think their actions have consequences. Ari Weinzweig: Yeah. Part three of the series is on managing ourselves. I think, honestly, it's the hardest part of the work. Most of us are raised to focus on everything but that, but the reality is, if I don't do a good job of managing myself, the rest will not go well, [00:19:00] inevitably. A lot of people have said to me over the years, "You should have written Part 3 first because people need to learn to manage themselves before they do anything else." I said, "That may be true, but A) I didn't, and B) the reality of life is, most people aren't that interested in it until we get ourselves into difficult spots in our lives by not managing ourselves well." Then all of a sudden, we realize we hit the wall at some point. Then we really need to do the inner work that actually allows us to make everything else we do more effective. I [00:19:30] think it's critical. Gail Davis: You know, Ari, I was recently with you in Austin, Texas. You walked the group I was with through your Creating a Vision exercise. 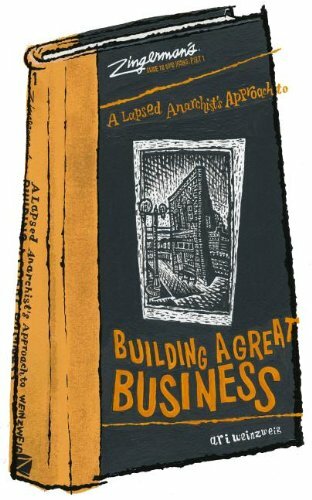 It was interesting to me because I kept thinking, "I can see how you created this vision for Zingerman's, but you have to have the personal vision, too, before you can really lead your company." I remember walking away with an extra one of your handouts [00:20:00] and thinking, "I should maybe take my sons away for a retreat. We could all share our visions." I haven't told you that yet, Kyle, but that's an idea that I have. Ari Weinzweig: I think the visioning process, I write a lot about it in the books, and we use it in pretty much everything here. Like I said in Austin, it's a life-changing process. It's really just about helping everybody get at what I believe now, in hindsight, we all really already know in our hearts, which is [00:20:30] the kind of future that we want to create. I just have learned through my own difficult experience, and I think most people have some similar version of reality, which is that through social pressure, family pressure, everything that pushes on us to conform with what everybody else does, it's hard to stay true to what you really want in your heart. This is a process, a recipe for vision writing that allows you quickly to tap back into that, and then to work [00:21:00] collaboratively with the rest of your organization, with your family members, your significant other, whatever it might be, to really come to agreement on a future that you're committed to going towards. Gail Davis: One of the notes I made when you were talking in Austin is you said, "Vision isn't really for your customers." Ari Weinzweig: No, we don't use it for that at all. We don't hide it. We're happy to share it, but the vision for us is a much, much more detailed picture of the future than most [00:21:30] people do. Most business books, most courses are going to teach you the two-line, three-line vision statement, which in honesty, with all due respect, I've never been able to distinguish, really, the difference between that and a mission statement. We like mission statements, but to me, the way we do it here, it's a very different thing than the vision. The mission statement is timeless and it gives you broad direction. We look at it like the North Star [00:22:00] that we're always going towards, but the vision is a time-constrained, time-specific, much more detailed description of the future because what we all know intuitively, if you don't know where you're going, hard to get where you want to end up. There's no right or wrong answer. I don't begrudge Starbucks' vision. That's their vision. It just doesn't mean we have to have the same one. Some people's vision of their business could be to stay very small. Other people's could be to grow big. Another one could be to go public. [00:22:30] They're all okay, but the key is to agree on where you're going so everybody on your team, everybody that you hire and yourself can make decisions accordingly. Gail Davis: I remember when we started to work on the visions, you said to put together a list of your prouds. Can you expand on what a proud is? Ari Weinzweig: Absolutely. The prouds are just to get your brain in the right space so all of the psychological research that I've read and [00:23:00] probably you've read shows that when you're calmer and feeling positive, your creativity comes out more effectively. It's in there anyway, but it doesn't tend to come out under enormous pressure. There's a place for the focused problem-solving work that so many of us are trained to do. That's generally in a very specific crisis. We've got to get out of this building right now, etc, etc. In terms of imagining a better future, that's not a problem. It's an opportunity. [00:23:30] By getting yourself rooted in the positive pieces of our lives, it just basically loosens up your brain in the same way that stretching before you run loosens up your muscles. It just makes more things possible. It's just a quick two, three, four minutes, but it just tends to get people re-grounded. Many of us are raised or trained to be anxious about what's going awry, but the truth is, most of us, especially me talking, [00:24:00] you interviewing and the people listening to this podcast, we're all pretty lucky, pretty blessed, whatever you want to say. We've got a lot of stuff and a lot of good things have happened in our lives or we wouldn't be where we are. It's good to be reminded of them before you start launching into the future. Gail Davis: I'm curious. Go ahead, Kyle. Kyle Davis: One of the things that you mentioned when talking about the vision was that you set specific targets going out there. I think you hinted at this, but a lot of people have, in their vision, they view it as their [00:24:30] mission statement or their company ethos. It's amorphic, and it doesn't really bind anybody to anything. By having these specific targets, you hit them or you don't. Is that what we're aiming at? Ari Weinzweig: That's a piece of it. We have this weird, to the rest of the world, way of doing it, but we do embed some key metrics in there. I think ranges are fine, so it's not like you flunk [00:25:00] out if you said we're going to do 20 and you did 19 1/2, but the point is that you have some scale. Our 2020 vision, which we wrote in '07 says 12 to 18 businesses located in the Ann Arbor area by 2020. There's a lot more to it than that. It's nine pages long, but it doesn't matter that much to me if it said 11 or 19. The point is it's not 500 and it's not five. We were going to grow, but we weren't going to grow at a gigantic [00:25:30] clip. That's not to say other people shouldn't grow at that clip. It's just, this is what was right for us. Those goals or those strategic elements are embedded in there because it gives clarity on what you're trying to create, but at the same time, we also put in way more emotionally interesting, engaging detail. How the people who are working in your organization are going to feel, how your industry feels about you, how you feel, perhaps, about your own work and about the contribution you're making to your [00:26:00] community or whatever it might be. Anybody in sales, and I'm sure there's a lot of folks that are listening that are in sales positions or marketing positions. We all know that people buy on emotion and then later justify on fact. Giving you the facts up front, it sounds like it should be helpful, but I don't think it really is. I think the biggest thing people want to know, how are they going to feel? Then the facts help them to justify it. The truth is, I don't have the solution [00:26:30] for the healthcare issue, but the truth is, if there was a vision for healthcare that talked about how you and I got treated when we went into the doctor's office, how we felt about our physicians and the healthcare professionals that were helping us, how they felt about their work, how the rest of the world looked at American healthcare as a model, those kinds of things actually are what are inspiring. The how the billing takes place or whatever, which is pretty much what everybody wants to talk about, is really not the issue. Those issues can be worked [00:27:00] out later if we would agree, if we could agree on a vision of what it was going to be like and what it would feel like down the road. Kyle Davis: Mm-hmm (affirmative). I think it's interesting, though, that you have that in there. Obviously, having a hard target like 12 to 20 businesses by a certain date helps hold you accountable. I'm in agreeance with you. If you're at 11 and not 12, you're close enough in my book. I think also having those, and those are very objective points. It's either real [00:27:30] or not, but then the subjective of how do I feel about something at a certain point. Is my heart still in it or am I going, "Okay, I'm feeling frazzled. Maybe I should do something else." Or "I'm really loving it. Let's double down," I think is also a good point that you brought up. Ari Weinzweig: Yep, the process works. My life is drastically better for having learned this. It's not how I grew up. In fact, I grew up with the opposite mindset, but it's drastically changed [00:28:00] our organization. We've taught it through ZingTrain and through the books, so literally many thousands of people, hundreds and hundreds of organizations literally all over the world that have put it into play. It's life-changing. People here, the recipe for writing a vision is not specific to writing a vision for your business. It can be used for writing a vision for your relationship, for your honeymoon, for your vacation, for your garage. It's really anything you're working on. It's just going to go better if you're clear on [00:28:30] what success is going to be like. If you don't get clear on it and there's multiple people working on it, the odds of them being in agreement are actually quite low. Gail Davis: One thing I'm curious about, Ari. I know you have a number of companies, unique companies. Do you have one overriding vision that applies to all of those, or does each company have their separate vision? Ari Weinzweig: Yes. Yes, [00:29:00] there's one overriding and then they all have their own. Ari Weinzweig: Each project gets one. Each job would have one. Really, whatever we're working on. It's just Steven Covey, begin with the end in mind. It's just, if you're going to open a restaurant, it sounds great, but is it a big restaurant? Is it a small restaurant? Do you want to be open three meals a day? Do you want to be open one meal a day? Some of that might, [00:29:30] in the end, get dictated by what you need to do to make your financial goals or whatever happen, but at the visioning stage, it's like, "What do you want to do?" Some people love a big restaurant. Some people love a small restaurant. There's ups and downs to both, but it's getting agreement on what that's like. People say, "We want to grow the business." Here, we're trying to grow the business and not sell it. Other people are trying to grow the business so they can sell it. It's not that one of those paths is bad [00:30:00] and one is good, but if you don't get agreement on which one you're on, it's very difficult to make appropriate decisions. It's also very unlikely that people will stay aligned because if all you said is, "We're going to grow the business," there's so many possibilities for what that really means. Something as simple as, you're taking your significant other and you're going to Paris for two weeks for a vacation. Y'all are super excited, but it turns out that one of your visions was to go to every museum in the city, and my [00:30:30] vision would be to sit in every good café in the city with a 20-minute entry to a museum, just because I was there. They're both fine, but you're going to end up having, many of us might have had this vacation. We end up having a lot of fights over something that we thought was going to be really fun. Both of those have merit. It's just, if you don't have the discussion up front and one person's getting up early to go to the museum. Another one's like, "What are you talking about? It's a beautiful day. I'm going to go sit outside and read in [00:31:00] this café," you're going to end up in a lot of conflict. As silly as that might seem, it's what's happening in organizations all over the world because the leaders aren't in agreement. Then when we hire people, if they're not clear on where we're going, you're asking them to enroll on a project that they don't know what it's supposed to do. Kyle Davis: I think we can all agree that to bring that down and condense it would be clarity is key. Ari Weinzweig: Clarity is key. Knowing where you're [00:31:30] going drastically increases the odds of getting where you want to go. Kyle Davis: Yeah, just flying by the seat of your pants doesn't work anymore, does it? Ari Weinzweig: It works if that's your vision. There's nothing coming from me that says you have to decide X, Y and Z. The point is, if your vision is that you play it by ear and just play it as it comes, I think that's great, but then the key is that you want to be clear about that to the people you hire because I guarantee you if [00:32:00] you're not clear on it, you're going to end up hiring a lot of well-meaning people that, they think their job is to straighten you out and get you organized. It's going to be a very difficult relationship in that case, because you don't want to be straightened out. Kyle Davis: No, you want to fly by your seat. Then you're wondering, "Why am I having so much turnover?" Ari Weinzweig: Right. My point is just, if that's what you want to do, that's fabulous. You build a business with people who love the adrenaline rush, who love getting thrown in at the last minute and love scrambling and [00:32:30] staying up all night to cram about what they're going to do. In all seriousness, you can create a healthy organization that that's their focus, but most people you hire are not going to think that's what they're hired to do, and they're going to be very frustrated when they were about to go their kid's soccer game and you call them and go, "Dude, we're opening a new business at 4:00 today!" Kyle Davis: Let's wrap by talking about the newest book that you have here, which is Zingerman's Guide to [00:33:00] Good Leading. It's part four. 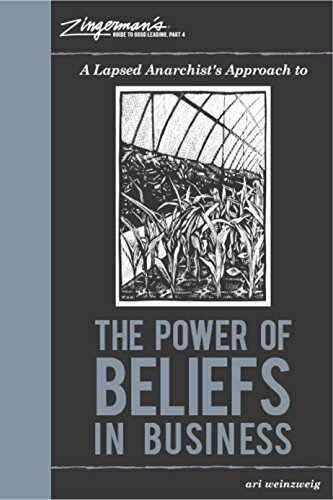 It's the Lapsed Anarchist's Approach to the Power of Beliefs in Business. I believe we've been hinting at this, talking about the belief system in yourself and where you're going, but what are the fundamentals of the book and what do you want people to take away? Ari Weinzweig: It sounds weird for me to even say it, but I honestly gave almost no thought to beliefs up until three or four years ago when I started working on the book. When I say beliefs, to be clear, I'm not talking about the three [00:33:30] areas of belief that dominate most people's conversation, which would be religion, politics and sports, in whatever order you want to put them in. Those are also beliefs, but that's not the subject of the book. In the context of business, beliefs are about everything. Beliefs about human beings, beliefs about your competition or even the role of competition, beliefs about, we talked before, who should be or shouldn't be in a meeting. Beliefs about meetings, beliefs about email, [00:34:00] beliefs about your significant other. We've got beliefs about our partners, about our coworkers, about the people we like working with and the people we don't like working with. It turns out that there's a self-fulfilling belief cycle, which I did not invent. I learned it from a guy named Bob Wright, who runs the Wright Institute in Chicago, and he learned it somewhere else. It holds true regardless. Basically, it turns out that what we believe, if you follow this cycle around, is just leading to things that reinforce what we believe. [00:34:30] If you believe that someone you work with is a jerk, then when you see them coming, you will, what will you do? You'll probably distance. You might roll your eyes. Your tone of voice might get kind of snarky. That will lead them to form beliefs. If you distance and act cynically towards them, they start to believe that you're a jerk, in which case, when they see you coming, they also act cynically and snarky, which reinforces your original belief. This is going on all day long, [00:35:00] for better and for worse. If somebody leads an organization and they don't believe in training, they will then in turn make no investment in training their staff. The staff, in turn, start to believe there's no real future in the organization because they're not getting developed. In turn, they do pretty mediocre work and the CEO goes, "Thank God we didn't waste any money on training. Look how bad this staff is." Conversely, if you flip the CEO's belief around and you have the belief we have, which is that training is a hugely positive thing, [00:35:30] then we do tons of training. We've got 65, 70 classes that we teach internally, just the ones for our staff here. When you start to do a lot of training for people and help them develop and grow their intellect and their emotional intelligence, etc, then they start to believe there's a really positive future. They start to get excited about that future. Then, of course, the quality of their work improves and we go, "This training's great. Let's do more." Totally opposite outcomes. The only difference in those two [00:36:00] scenarios is the belief of the CEO or the leader. This is going on all day long. Countries go to war over it. Basically, it's William James, the father of psychology in the 19th century said, "Belief creates the actual fact." What we believe is creating a great deal of our reality. Kyle Davis: I don't really have anything more to add on the books. I get there's a lot. Mom, is [00:36:30] there anything that you, any other questions that you have with that? Gail Davis: No, I just think it's fantastic that you got that history degree. You started out in a restaurant, deli. Then you've had such impact on culture and this visioning process and helping train people from all over. Maybe in the end, the history degree is what fueled the whole thing, Ari. Kyle Davis: It's the best degree. Ari Weinzweig: I have no regrets. I think it has, I think you're right. It has a ton of positives. [00:37:00] I just mean there's no job you can get because you have one. Ari Weinzweig: Jobs aren't everything. That's the amazing part of the work. I really believe these approaches are universal and the key of them really is about operating in alignment with human nature and honoring human nature. I really believe that the mainstream business approaches are actually antithetical to human nature. [00:37:30] That's a lot of why they don't work well. That's why people burn out. That's why they're exhausted and unmotivated and disengaged. Conversely, when you operate in alignment with human nature, then people want to be part of something great. They want to work hard. They want to learn. They have to have fun. They want to believe in what they're doing. The difference in the output and the energy of the work is phenomenal. Kyle Davis: [00:38:00] I think that's probably a good place for us to wrap. As a fellow history major, I will say that while there is no history jobs directly out of college for most of us, I think having that ability to be able to read analytically and be able to remove the fluff and get to the fact is highly important. I encourage everybody to get one. Ari Weinzweig: Absolutely. There's no criticism of this study. Kyle Davis: Oh, no. There's no criticism. Ari Weinzweig: I'm purely owning the reality about the job market. No, I think it's really universal. [00:38:30] I had coffee yesterday in the morning with, I don't know how old she is. She's a student at Michigan. She's reading part 3 of the book on managing ourselves. She heard me speak on campus, and she wanted to get together. I put my email in all the books. She's talking about how much she's on the tennis team. She's talking about how much difference it makes, and how she's trying to teach it to the rest of her teammates because she realized, it's all about learning and having fun and growing. It's got [00:39:00] her super motivated. To me, that's, to your point, that's really what makes it worthwhile is contributing positively to people's lives. Kyle Davis: I think it's, to your point as well, when you were talking about continually learning, especially the fact that you and your company provide just, I think you said 65 courses of training year-round. Just being able to be continually educated and learn, because if you're not learning, you're not growing. If you're not growing, you're dying. Ari Weinzweig: Absolutely. Couldn't agree more. Kyle Davis: [00:39:30] Birds of a feather flock together, right? Ari Weinzweig: Absolutely. Apparently so. Kyle Davis: Ari, I think this is a great place for us to wrap. I think for those listening, if you want to have Ari Weinzweig come and speak for you, you can do so by contacting GDA Speakers. The number is 214-420-1999. Then all of the books that we've mentioned, we're going to make available on the podcast [00:40:00] website and redirect over to Zingerman Press. Other than that, Ari, thanks again for your time. Yeah, thanks. Gail Davis: Thank you, Ari. Ari Weinzweig: My pleasure. Have a wonderful day.